Your fireplace not only adds warmth to your house, it adds elegance and charm that reflects your home style and lifestyle anytime of year. But like doors and windows, fireplace surrounds, mantels, over mantels and chimneys must enhance the Old World style you have selected to be true to the design, be it French country, English cottage, Tuscan farmhouse, Arts & Crafts bungalow, or traditional American design . An amazing selection of fireplace related materials and decorative accents are available today at almost any price level to suit your construction budget. There are authentic antique European surrounds, mantels of stone and wood along with antique clay chimney pots of all sizes and descriptions from the simple to the ornate. These too are available in appropriate styles such as exclusively antique French or English chimney pots with their distinctive architectural signature. Chimney pots of all sizes and descriptions are also available and can be found in a style and material that will give your house the distinction you want. Many are made with the same standards that they were a hundred years ago. As one manufacturer says; “Chimney pots provide the finish and add the crowning glory to the look of your house”. Pots made of copper or clay add the final touch to your Old World plans. Many custom copper architectural products are also available to dress up and protect your chimney. In addition to chimney pots, copper chimney caps come in a variety of styles, shapes and sizes. Custom copper is a great way to highlight a feature of your house and add quality and value that will last a lifetime. The look and function or the chimney is a major portion of successful home design, but the look of the interior is of course just as important. A fireplace surround, and overmantel must reflect the period home style you have selected. Many regions have a distinctive look that is reflected in their fireplaces. You can have that look in your house by using imported antique surrounds or good quality reproductions. Some specialty shops offer authentic antiques from French chateaux to Italian manor houses. You will also find antique fireplace accessories and other related items. Classic Louis XV Mantel by Francoise & Co.
Hand-Crafted Limestone, crafted marble, and travertine surrounds, and mantels in the Old World tradition are available in many “Old World” styles. These are revivals of ancient Italian and French designs and add unmistakable elegance to any room. Francois & Co. has a collection of hand-carved mantlelpieces that are the mirror image of antique mantels discovered in France and hand-carved by French artisans. They are made of hand-carved limestone or “Scagliola Stone”, some of the finest stone available. The right mantel offers an opportunity to create a powerful statement that defines the architectural style of the interior decor. Similarly, cast stone mantels and surrounds are available in a variety of mantels that are very similar to those made of cut limestone that will look amazingly authentic. These are made of a mixture of finely graded aggregates, silica, sand and a bonding agent. All are mixed and hammered into molds. The finished product is noncombustible and can be used directly against the firebox. Cast products are available in affordable copies that are easy to install and adapt to masonry, precast fireboxes or prefabricated gas log firebox interiors. The difficult task is finding the right style and manufacturers suited to your needs. If a wood mantle is what you are searching for, there are as many, if not more, sources to choose from as there are for stone mantels and fireplace surrounds. Some manufacturers will even carve your crest, logo or emblem in the center of the over mantel if you desire. These mantels are available direct to the trade and can be ordered by your builder or architect to suit your needs. Antique wood mantels are often favorites with designers and are also available through antique and architectural salvage shops. Of course, not all architectural styles and fireplace needs can be satisfied with pre-made mantels and surrounds. Mantels crafted by skilled carpenters and, or, stone masons are often the best approach for many historic or Old World residential designs. Arts & Crafts Bungalows and mountain lodge style homes are well suited for dramatic stone fireplaces with wood or stone mantels that blend with the architectural style and period of the house. The inside, or the working portion of the fireplace, presents many other options too. Traditional firebox and chimney design and construction is best left to a qualified mason experienced in the art of chimney design. The performance of your fireplace will depend on a number of factors that need to be addressed by your contractor, and you have the option of solid masonry, metal and pre-fabricated masonry systems. Today, there are a number of firebox and chimney options that are available to you to save money and still have an authentic looking fireplace. Pre-manufactured fireplace systems such as Isokern, make it easy and cost less than traditional methods. These systems are modular, masonry systems that can be assembled and installed in under a day. Unlike traditional masonry units that can take weeks or months to complete, experienced installers can install several of these systems in a day. Isokern systems can be custom finished to satisfy homeowner, builder or interior design needs and the modular design of such a system allows for more diverse, lightweight applications for fireplaces and other appliances. New lines of attractive, efficient gas fireplaces , ventless gas fireplaces, electric and wood burning inserts allow you to have warm accents in any space in your home. A wide variety of styles from two sided fireplaces to ones small enough to be housed in a bathroom or kitchen make just about anything possible. Choose a door to match the house style, as on this French Country by New South Classics. Some details matter more than others, and the selection of the right doors can mean the difference in having an “authentic” Old World look or not. In short, a door should embody the architectural character of the building. Subtle differences in door design and construction point to the authenticity of French, English, Italian or American classic residential design. Doors are often the focal point of a design and at least the element of your home’s design that will be noticed by everyone before anything else. It says “welcome” and speaks volumes about you and your house before anyone even steps inside. There is no better way to make a first impression. The question you have to ask is; “what style is appropriate for my design? Because doors can vary greatly in price based on whether they are exterior or interior doors, the material they are made of, how they are made, where they are made and whether they are new, or antique, it is important to shop around and learn all you can about the above. The style of the house will dictate the style of the door and the importance of the main entry door(s) may determine the style of all the exterior doors. I like to think that there is a priority of exterior and interior doors as in primary, secondary and tertiary importance. That will help you select doors that say something about the spaces they serve. For instance, the door above would be fine for the front door, but perhaps a little to elegant for the kitchen door, but it’s style may “drive” the choice for the kitchen and other exterior doors. Where to start? Door manufacturers usually have a number of styles available and categorized into groups such as “southwestern”, “French”, “Tuscan” or “English”. Eliminating all doors that do not fit into your particular style home makes it much easier to narrow the choice down and focus on details of the correct selection of doors available. You will find that several key elements of door design make it American, English, French, “Tuscan” or whatever. For instance, Historic American “frame and panel” solid wood doors (which replaced plank doors) are often composed of six raised panel construction and painted or stained. These typically have standard proportions and placements for the vertical and horizontal elements around the panels known as “rails”, “stiles” and “muntins”. All doors will be contained in the casing or door surround. These, too, have styles that are traditionally correct for the door style you have selected. Doors may be dressed up in a number of ways including the addition of a portico. A portico refers to a covered entrance usually supported by columns. Porticos are also called surrounds, overdoors and entablitures.hey add a refined element to an entrance by framing the door and adding an architectural element that is attractive and functional as seen in this example by Historic Doors. Note: You may want to take a look at some of the reference books I have suggested in previous Blogs, if you want to learn more about the correct style door and surround for a particular place, time, or region (along with do’s and don’ts of proper construction). You can also refer to many door web sites that offer a variety of interior and exterior door styles to get an idea of manufacturers and prices. The choices are endless and like everything else, not all doors are made equally well and prices will vary depending on quality. You will notice that each region of Europe and each region of a particular country has a door style that is specific to that region and particular time period. While Old World European doors have many similar characteristics to one another, it is, again, the small details or variations that make one door more suitable for a house style over another. These doors may be classical, rustic, Gothic, Arts and Crafts and many in between. Some doors employ a combination plank and panel construction while others reflect a true plank tradition with arched tops and decorative, medieval hardware such as studs, and wrought iron strap hinges which come in a multitude of styles. This style with its distinctive detailing is common in Spanish, and Mediterranean architecture and as can be seen below, in France. Arched top or top radius doors are very common in France. These may be solid with two to three raised panels, all glass with divided lights (window panes), or glass above a single or double solid panel as in the door on the quaint cottage in the Loire Valley pictured at right. Note the vertical plank “storm door” on the outside with its diagonal and horizontal bracing. The arched top is alao seen in double arch top doors for wider entries where two doors are desirable. Of course double arched top doors are available in all the varieties described above. and lend themselves particularly well to French and Italian style architecture. A similar effect may be achieved by selecting a double radius top panel (glass or wood) in a full arch, flat arched panel in square top frame and casing. Nothing is more frequently used than the “French window” which as become known here as the French door. Its simplicity and practicality allows a space to receive maximum light and openness by swinging one or both door panels inward or outward, effectively doubling the width of a single panel door. Again, these may be solid wood, all glass or any combination thereof. French doors are often topped by a glass transom spans both doors below for a taller effect. More elegant options include a fan light above and even flanking the doors with side-lights for more light as in this photo of a house outside Paris. What if you prefer painted doors and trim? Well, there are several options you may want to consider…..Solid Wood doors can be painted or stained. If stained, be sure to see samples of the various wood species to see how the color stain you prefer affects the wood you have selected. The manufacturer of the doors can provide samples for you to select from and offer advice on which stain and wood will result in the color and effect you desire. Many woods and finishes are available for interior and exterior application. Not all manufacturers offer the same selection. It is important that careful attention is paid to the wood species that will be best for the intended use and selecting the right finish for that species of wood. You should do the same with trim and casing to be sure that those and the doors match. “Distressing” is often available to emphasize the aged look you desire for your Old World door. If you plan to have painted trim and doors, MDF or medium density fiberboard may be the right choice for you. Interior and exterior MDF doors are available in paint grade and are environmentally friendly. MDF is an engineered wood product made from recycled and recovered wood fiber. They are more stable and durable and more affordable than wood in many cases. As with other doors, there are many variations of MDF doors with different construction details. Better doors are solid MDF with solid wood edging systems along both edges for strength where hinges and door hardware attach. Look for similar detailing along the top rail if doors are to be hung as is the case with pocket doors. The Arts & Crafts or bungalow style doors ranged from plain to ornate. The most common were frame and panel, and board and batten. These doors often had decorative panels, beveled, leaded or etched glass in addition to the basic door. Some, as shown in the door to the left had an iconic square shelf supported by square rectangular blocks with rectangular windows above. French doors (single or double) were also common for exterior doors and usually had rectangular glazing and (or) rectangular panels. Often exterior arts & craft doors had sidelights and transoms above. English and Japanese influences are evident in much of the detailing of the bungalow right down to the doors. Don’t forget the garage door! Because they are large and there may be two or three of them, the garage doors will influence the character of the house and must be attractive as well as functional. Even the garage should be designed in the detail you expect of an Old World home. It must reflect the character of the house and look as much a part of the house as any other aspect of the design. Sometimes it is good to pick a style such as plank or panel as the motif for your major doors and continue through with the garage so there is continuity. Often these doors are referred to as “carriage house” doors and they can have as much character as any other door. The character may be determined by the color, materials, and detailing such as hardware. Character can be added through careful consideration of paneling, whethre vertical, or diagonal, with cross bracing and the addition of windows. The window options are similar to other windows with respect to size of glazing, muntin width and spacing, etc. 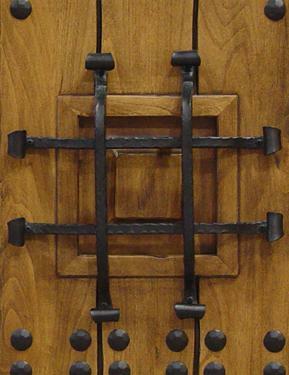 Strap hinges add character and may be functional or decorative. Hardware produced by the local blacksmiths at their forge and anvil was common to many early American homes. Some sources today feature their own blacksmiths using 18th century tools and techniques. This hardware is carefully built to ensure that it will function, as designed, for many years to come. Garage doors may have the traditional appearance of carriage house doors, yet open vertically with an automatic garage door opener. There are even openers designed to swing out on hinges. If you use hinged doors, just remember to widen the opening by four to six inches to allow for the width of the door panel and hardware. Specialty doors are also available for most any need. Often special rooms require a door that says something about that space while still adhering to the Old World door look you are after. These doors may be solid, paneled, fully glazed or any combination of these. Wine cellars, for instance, are great opportunities for a special door. They add to the character of the space and provide an opportunity to make something special of the space that will enhance the experience of storing and displaying your wine collection. This blog is not intended to explain all there is to know about door detailing. It is hoped that this blog will make you more aware of the importance of selecting the right door for your house and give you access to a few of many sources to research options available to you. Make sure that your architect or designer has considered all the appropriate door options in the right “style” for your new home. This may get them started in the right direction. The correct hardware adds to the distinctive appearance of your Old World door. Many manufacturers offer stock period hardware from which to choose. Others offer custom made hardware for handles, hinges, bolts and other forgings custom designed for your doors. Not only does a good roof shield against the elements, it says a lot about your house. A roof should blend with your style of architecture but not dominate it. Fortunately, today there are a wide variety of quality roofing materials that meet most budget and design requirements. Pricing depends on the roofing material, features such as design, color, texture, thickness and its guaranteed life. The owner must weigh the benefits of long life and style against material and installation costs. In addition these and other factors influence the success of a roofing material in helping a design look “authentic” to a particular style. With today’s emphasis on “Green” building, cedar shakes are a popular roofing material with environmental benefits attributed to using wood products. Shakes also have precedence in Arts and Crafts as well as Old World residential architecture. Synthetic shakes are available from a number of sources in a variety of colors and styles and come with up to a 50 year warranty in many cases. What type of roofing is right for your design? The French, English and American classics are well suited for natural slate which has precedence with all three. Slate is one of the most durable roofing materials with benefits including longevity, appearance, durability and energy conservation. If weight or cost are an issue, there are a number of good synthetic slate materials that convincingly mimic natural slate and are fire and impact resistant. As an alternative to natural slate, concrete tiles offer some “green” benefits according to the manufacturer such as “a 50% reduction in the amount of heat penetrating the conditioned space” and “a 225 reduction in energy consumption” in addition to a variety of styles to imitate natural slate, wood shingle, and clay tile. Authentic clay tile roofing is often the roofing material of choice for European or Old World houses. Some clay tile roofs actually are available with an aged look to contribute to the “Old World” look you hope to achieve. Some clay tile roofs are good for at least 100 years and actually look better as they age. From lightweight clay tile to “cool” roofs, clay tile roofs have many benefits. Clay tile roofs can help you save on energy costs and reduce heat stress, protecting your roof underlayment from failure. Another modern roofing material is the composite shingle manufactured to simulate natural slate. These asphalt shingles come in a wide variety if shapes, color and styles. The most popular are the “Designer” or “Architectural” shingles emulate the look of slate and other natural materials. Metal roofing is lightweight and re-recyclable and comes in a multitude of profiles and colors. The standing seam metal roof is predominant in many coastal areas of the eastern United States and made famous with the terracotta color roofs of Charleston and the “Low country”. It also is available as a metal shingle in imitations of “slate”, “tile” and “wood”. Properly selected and installed, metal roofing can add beauty to any building. Some, such as Follansbee’s TCS II, offer soft-looking, protective patina that’s developed after exposure to the elements. Yet, the metal is not degraded by heat or UV light and never needs to be painted. TCS II is oxygen reactive, so the patina is formed by exposure to even pollution-free air in rural areas and on coastal breezes. For an authentic classic English Cottage “Old World” look, you may want to consider thatched roofing. It offers timeless appeal and is applicable to many English cottages. For instance, our English Cottage Classics offer an assortment of homes that would be a great opportunity to use a thatched roof. Our Fireside Cottage with a thatched roof is a good example. Some manufacturers such as “Endureed“, have synthetic thatched roofing materials that they claim are some of the finest available, with “benefits unmatched by inferior synthetic thatch products.” Their specs claim that their materials have “a Class A fire rating, will not attract insects, rodents or birds, and can withstand a 110 MPH wind with no maintenance required.” This material is manufactured in the United States and the price compares to natural thatch. These are just some of the shingles, styles and sources available. Hopefully this blog has made you more aware of the choices and unlimited possibilities available to you. Ever wonder what makes some houses really look French and others truly look Italian? Of course traditional detailing of the period including roof pitch, building materials, and massing make up the bulk of what makes a particular style identifiable, but part of what makes an Old World design “authentic” is how the small details are handled. Aside from the architectural detailing, there are countless other product details that will affect the ultimate success of your residential design. The web has made it possible and easy to research any variety of products from hardware to lighting fixtures, doors to fireplaces, and fixtures to finials. The difficulty is in narrowing down those choices to the select few that are appropriate for your “classic” Old World design. As a first step to get you going in the right direction, New South Classics has created a “Suggested Links” page to highlight a select group of products and services we believe may be among the best choices for creating the Old World effect you want to achieve. This link may be a good start and serve as a “pattern” for other products from other sources and at all price levels. This list is updated regularly as we discover new sources for products you may want to know about as you and your architect design your new home. In addition to this page, we will let you know of additional building material or product suggestions we find that may or may not be on our suggested links page in future blogs. If you’ve nailed down the architecture and your design for your old world home has the correct massing, materials, style, and feel of the authentic period you were hoping to emulate, you will need to be sure to follow through with the right details. These details accent the primary elements of the design composition and make it interesting and authentic. Because there are so many sources for everything you will need to dress up the house, I thought it may help to point out a few “standards” of Old World Design that will make your house look authentic. In my blog entitled “Roofing says a lot about a house” I addressed the issue of how important the roofing material is in any design. I emphasized that roofing may be one of the most important design components of any house. You will be able to find sources of appropriate roofing material there, and go to various web sites that will steer you to the region and style you are looking for be it slate, clay tile, synthetic slate, or composite material. This blog will start at the top of the house by exploring the detailing that makes a French country house look more “French Country” from the roof down. Many Old World homes especially in France, sport decorative elements called finials and ridge caps at the top. Today, finials also serve as a decorative housing for lightning rods. These are usually made of copper and come in all shapes and sizes. They are a distinct feature of French architecture and turn a beautiful patina as they age. Other accents that are not only decorative but functional in French architecture are roof vents. These are more often than not made of copper and come in a number of shapes and sizes depending on where and how they are to be used. Other copper ornamentation can be found frequently along the ridge of the roof in the form of ridge caps and weather vanes. Many Old World Houses in America, England and France have incorporated cupolas atop their roofs for ventilation and decorative purposes, usually topped by a wood or copper finial or a weather vane. These cupolas then and now were fashioned out of wood or sometimes copper which weathered to a soft green patina as shown in the photo to the left. Chimneys were a very important part of the home and chimney detailing expressed the significance it played in family life. Perhaps the most obvious ornamentation is the “chimney pot”which has a functional as well as visual purpose. These caps or pots are available in copper or clay and come in a wide variety of styles typical of various regions of Europe and America. These chimney pots come with a variety of optional accessories including wire screens for control insects and animals and caps to keep rain water out. Another functional yet aesthetic detail that helps make your house look authentic are gutters and conductor heads. Typically, European and other Old World houses have copper gutters and downspouts. Of course, there are many options available as “spin-offs” that look like copper in aluminum and other materials. Nothing looks as authentic as copper. Gutters can be rectangular, half round or shaped and gutter-heads are available in a variety of shapes and sizes. Here, a 6″ half round gutter with copper straps is shown with a large copper conductor head to collect the water. The leader pipe is strapped to the wall with copper strapping and completes the detailing to make this house look truly French country. In considering the detailing of your Old World home, be sure not to forget the gardens, and other aspects that place your house in the setting that speaks of its design origins. The smallest details such as plants, vines, rock walls, paths and lighting give the house character and make it believable. In another blog, I discuss more ideas to achieve that authentic look with additional detailing suggestions and product sources. A “Green” Lining to The Economic Cloud? It may be a stretch, but perhaps there is a silver (or “Green”) lining to the housing and economic crisis. Those considering a new or second home are fast learning the value in smaller homes that have been popular in all countries for centuries, but often overlooked in the rush for “bigger is better”. Suddenly there is a growing awareness of the charm, practicality and cost effectiveness of smaller, sustainable houses proving that less is more. In addition we are learning of the benefit to the world (and our finances) of “Green” building. Many “Green” solutions are a result of common sense and cost little to achieve. Higher energy prices, global warming and tight lending policies have provided incentives for us to seek something better in a lifestyle. All this translates into affordable construction, quality design and sustainability. This added to the fact that the “Baby Boomers” will be downsizing their empty nests and wanting to improve their health and quality of life at the same time. You’d be surprised how functional, efficient and livable a 1,600 to 2,600 square foot house can be. In addition you will have fun selecting or designing a new, efficient plan that suits your lifestyle. These plans come in all styles and often have surprizing open areas with vaulted spaces that lend themselves to entertaining and comfortable living. Consider the possibilities with English Cottages, Arts & Crafts Bungalows, French Country houses, and Mountain cabins! “Not so Big House, A Blueprint for The Way We live” by Sarah Susanka and published by The Taunton Press tackles the question of why we are drawn to smaller, more personal spaces. “The Not So Big House proposes clear workable guidelines for creating homes that serve both our spiritual needs and our material requirements, whether for a couple, with noi children, a family, empty nesters, or one person alone”. “The New Cottage Home” by Jim Tolpin and published by The Taunton Press explores 30 cottage designs from the East coast to the West coast. If you want to find inspiration for a simpler, scaled down lifestyle in a cottage home, this book may prove interesting. ” Cottages By the Sea” by Linda Leigh Paul and published by Universe Publishing explores the handmade homes of Carmel, America’s first artist community. This area is home to some of America’s most charming but rarely seen cottages. 270 color photographs document the private world of 34 homes. “Cottages on the Coast, Fair Harbors and Secret Shores” by Linda Leigh Paul and published by Universe visits private cottages on the coasts of the United States to inspire you to live the cottage life. Beautiful color photos of these private homes display their interiors and exteriors and each is accompanied by the story that makes them special. Mulch timber cut on site for use on property. “Green” construction standards established by the United States Green Building Council (USGBC) http://www.usgbc.org/ provide guidelines for sustainability for builders to follow that will result in health and economic benefits for home owners. Take a look at their “Green Home Guide” In addition, the forthcoming National Green Building Standard proposes even higher standards for sustainable construction for builders to achieve certification on a voluntary basis. It is expected to be approved by the American Standards Institute (ANSI) by 2010. These standards will help builders realize efficiencies in water, energy, building materials and air quality. The goal is to help builders construct homes that perform better and cost less. Another helpful web site for “Green” home solutions is: http://www.energystar.gov/index.cfm?c=about.ab_index Energy Star is a joint program between the US Department of Energy and The US Environmental Protection Agency. Now may be the best time to build a custom home and build in energy savings! Lumber prices are on track to drop to a 10-year low, according to Bureau of Labor Statistics data, partly because demand for homes is declining. Builders in the Columbia area have taken out 35 percent fewer building permits in the first 10 months of the year than they did during the same period in 2007, and home sales in the Midlands are down 17 percent for the year. Oil-based products, such as carpeting and shingles, are still high, builders say, but should see a drop soon, too, as the price of oil falls. Labor costs also have dropped, Dunbar said, because so many subcontractors are scrambling to find work as home buying has slowed amid a credit squeeze and financial turmoil sweeping the nation. Baudo said people already are reserving slots with him for next year to build homes in the near-$1 million price range. One customer even gave him a check for $10,000 to hold a March time slot and he doesn’t even have an architectural plan yet. “I’m busier now than I’ve ever been,” Baudo said. Local builders said some people who took money out of the stock market are investing it in real estate instead. Look for other “Green” building ideas by visiting our New South Classics’ web site! With French Country houses, English Cottages, Tuscan villas and classic houses of our great American residential heritage being among the most popular house styles today, there are many possibilities for your new or second home. With that in mind, what style is appropriate for your site, setting, and lifestyle? This can be a daunting question if you are not an expert on residential design history around the world. Ever wonder why some houses “just don’t look right?” Or had the feeling that this house looks “sort of ” Italian? With so many house plans claiming to be French country, English cottage, Tuscan, or other there are thousands of poor imitations. You may have an idea of a style that appeals to you, but do you really know how to tell a French Normandy farmhouse from an English cottage and what similarities they have in common? How about the differences in design, materials and detailing from from one region of a country to another? Another great book about historic American houses and how to recognize authentic period detailing is “Get Your House Right, Architectural Elements to Use & Avoid.” by Marianne Cusato & Ben Pentreath and published by Sterling, New York and London. This is truly a highly detailed (over 1,000 meticulous line drawings), clear and informative work that will help anyone wanting to be sure that their “historic” American home is designed correctly. If you’re looking for a survey of authentic, historically designed homes rooted in the design principles of the past you may want to check out “Creating the New Old House, Yesterday’s Character for Today’s Home” published by The Taunton Press. The author shows it is possible “to craft a new home with familiar forms and harmonious proportions of tradition that is also tailored for modern living”. Photographs of each of the eighteen homes featured in this book are examples of classic regional style of new homes across the country. “A Field Guide to American Houses” by Virginia and Lee McAlester and published by Alfred A. Knopf, New York will enable you to identify in their Historic and architectural contexts, the houses you see throughout America. Black and white photographs and detailed sketches trace the history of the American house from the 17th century to the present. Each chapter treats one of the major architectural styles that have been popular over our country’s past. Identifying features, principal subtypes, variants and details are thoroughly explored. An essential small book that is large on detail about residential design details is “Architectural Details” by Marcia Reiss and published by Thunder Bay Press, San Diego. It is a concise visual guide for recognizing architectural styles and features. With over 300 drawings and photos it discusses a vast range of contemporary and historic houses. Visit New South Classics’ Postcards from Charleston from our most recent tour of Charleston, South Carolina for a tour of some of America’s most admired classic residential design. A few references that will help you define the classic Arts & Crafts Bungalow and what makes it different from other small houses are suggested below. These books may help you learn the basic elements that define these small, one or one-and-a-half story houses. Typical design elements that set this style apart from others are low-pitched roofs, exposed rafter tails, low, gabled or shed dormers, shingle siding, the use of rustic native stone, brick, and fixtures of wrought iron, art-glass, and interior hand-crafted detailing. Maybe you can apply some of these design elements to your own classic bungalow. “Bungalow Details: Exterior” by Jane Powell and Linda Svendsen and published by Giggs Smith, Salt Lake City is “the ultimate book that will teach you how to incorporate these elements into your home’s design. Included are historical sidebars and general how-to information that will enable you to anticipate, re-create, or apply them to your unique bungalow.” Detailed photographs of building materials, windows, doors and the smallest elements of bungalow design are included along with the author’s own list of resources for where to find authentic elements of the arts & crafts home. “The Bungalow, America’s Arts & Crafts Home” by Paul Duchscherer and Douglas Keister and published by Penguin Studio focuses on the popularity of the California bungalow, one of the most popular housing styles in America. The book contains 197 illustrations covering everything from exterior detailing and interior architecture, furnishings and decorative objects. In addition, the book touches on many other craftsman style like the Swiss chalet, Spanish Colonial, Prairie and Oriental. “The Arts & Crafts Cabin” by Robbin Obomswain and published by Giggs Smith, Publisher focuses on the today’s hybrid cabin design. These are homes inspired by the original Arts & Crafts movement of the 1800’s and relate to the natural environment and are simple in design. The book is filled with plans and inspirational interiors. Line drawings, sketches and rich color photographs bring the current arts & crafts trend to light. “American Bungalow” is an excellent magazine featuring just about everything to do with preserving, restoring and building an arts & crafts bungalow. Another magazine that may prove interesting is the bi-monthly “Cottages & Bungalows” which covers everything from design, landscape, interiors and more. “Style 1900” is a quarterly magazine exploring the antiques, architecture, philosophies, and personalities of the Arts and Crafts movement in America and Abroad. If you’re looking for English cottage design, it may be helpful to start by taking a look at actual photos of English villages with their subtle differences. English houses have distinct differences depending on the period and region of the country. Hugh Palmer has produced what I call “coffee table books” with stunning images of those ancient towns “in which the true heart of England lies.” His book, The Most Beautiful Country Towns of England”published by Thames & Hudson, New York will let you see true English cottages in their natural setting and serves as a traveler’s guide to England’s glorious countryside. A similar book by James Bently entitled “The Most Beautiful Villages of England” published by Thames and Hudson Ltd., London. You will be able to appreciate the different regions by county (northern, midland, eastern, southern and western) with its rich color photographs and absorbing commentary. Hugh Palmer is a leading British photographer of architecture and gardens and has masterfully captured the architecture of each. As the author says, “history,location and local building materials have etched the distinct character of each region and each village”. Other books worth noting that zero in on specific English styles popular in America include “Tudor Style, Tudor Revival Houses in America from 1890 to the Present” by Lee Goff and photographs by Paul Rocheleau and published by Universe Publishing. The Tudor house is “one of America’s keystones” and is a type of house that has attracted homeowners in England for centuries and in America for over a hundred years with their easily recognizable steep gabled roofs, leaded windows, half-timbering and intricate brick work. As with the other house styles, perhaps the best way to become familiar with classic French residential detailing is to take a trip to France. That way you can experience first hand what French country design is all about and experience the variety of styles from region to region. In lieu of that, there are many fabulous books of stunning photography and narrative to bring French Country architecture to you. From the half-timbered houses of Normandy to the splendid Renaissance chateaux of the Loire, or the beauty and distinction of the small towns of Provence, France has a residential style for all tastes. Our New South Classics’ Postcards from France from our last trip to the Loire Valley region of France may get you in the mood! “Living in Normandy” by Serge Gleizes, and Christian Sarramon (photographer) This book contains a wealth of information including a first hand glimpse into typical Norman homes with half-timbering, thatched and slate roofs, mansard windows, turrets and balconies. If you like food, it even offers restaurant guides, hotels, brasseries, bed and breakfasts, antique dealers and tips on where to sample the famous local products. As with American, French, and English houses, Italian and Mediterranean houses vary in style, materials and technique depending on the region of the country. Ranging from private villas, castles fortresses or farmhouses, the private residences of Italy seem somehow connected to the land and reflect the richness of the Italian lifestyle and history. The beauty of one region, Tuscany, in particular, with its vineyards, rolling hils, lush valleys, and clusters of red tiled villages embody the ancient artistic and architectural heritage of this region. If you want to focus on Tuscany and surrounding areas, two books by James Bently portray the remarkable variety of this region through stunning color photographs and accompanying written commentary. They are “The Most Beautiful Villages of Tuscany” and “The Most Beautiful Country Towns of Tuscany” by Thames & Hudson, Ltd., London. “Living in Tuscany” by Bruno Racine and published by Flammarion, Paris, is a more detailed look at Tuscan life. Beautiful photographs and accompanying narrative cover topics as varried as the vineyards and rolling hills, gardens of Tuscany, Tuscan interiors, artistic heritage, places of special interest, and even a visitor’s guide with the best addresses to discover the true Tuscany beyond the tourist trail. “Italian Country Hideaways” Vacationing in Tuscany’s and Umbria’s Private Villas, Castles and Estates by Kelley F. Hurst and published by Universe Publishing, New York, offers a glimpse into gracious estates and their owners. ” Following an introduction to the local food and wine, historic sites, and other points of interestin each region, the book presents a selection of unique estates, highlighting their most memorable features, from their delectable food and noteworthy decor to their impressive architecture…and fascinating history”. If it is the Mediterranean style with Spanish influence that appeals to you, you may enjoy reading “Red Tile Style” by Arrol Gellner and published by Viking Studio, The Penguin Group, England. This book is a vivid exploration of the historical roots and modern-day applications of Spanish Revival architecture in America. Over 300 brilliant photographs trace the style of small houses or casitas to large estates in many variations including Monterey, Moorish, Mediterranean, and Pueblo. Chances are that there is a Barne & Noble near you that sells the magazine “Tuscan Style” . I have found this magazine to contain interesting articles and fabulous photographs of Tuscan and Mediterranean homes featuring exterior details and sumptuous interiors. It is pricey at $9.95, but you just may find some great ideas for your housE. You are currently browsing the blog archives for November, 2008.